The Core SWX Powerbase EDGE in a V-mount is a 14.8V, 49Wh, lithium-ion battery featuring an 8A continuous draw. This follow-up to the popular Powerbase 70 battery offers multiple modes of use. 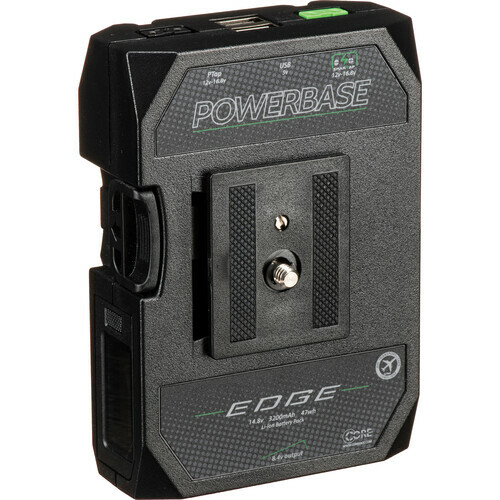 In addition to the V-mount, which allows it to be used with all cameras supporting a V-mount battery, the Powerbase EDGE has an 8.4V regulated DC output, a D-Tap output, a SmartTap output, and two USB ports. Using the appropriate Powerbase EDGE power cable (sold separately), you can connect the battery to most mirrorless and DSLR cameras via the 8.4 VDC output. The SmartTap output, which is a Core SWX innovation, is a standard D-Tap connection with additional contacts inside that communicate SMBUS/smart battery data to compatible cameras. Other than this, it works just like a regular D-Tap port and supports standard D-Tap cables. Accordingly, you can use either the SmartTap or D-Tap port to power a camera using an optional D-Tap cable. The remaining one can be used to power an accessory, and likewise the USB ports can be used simultaneously with any of the other power options to power 5V accessories or charge mobile devices. The D-Tap port also functions as a charging port and supports D-Tap chargers such as the Core SWX PB70C15. The Powerbase EDGE has an LCD on the side that provides runtime in minutes. Located on the side, it's easy to check on and read during production. Moreover, a button-activated backlight allows you to see it clearly in dark environments. Like the Powerbase 70, the Powerbase EDGE comes with a small quick release adapter that provides a convenient way of attaching the battery to cheese plates and other camera supports. It secures onto the middle of the battery and provides a 1/4"-20 mounting screw. If, for example, you're looking to power your camera using the battery's D-Tap port, the quick release adapter provides a convenient way of attaching the battery to your rig in order to do that. Box Dimensions (LxWxH) 8.0 x 6.9 x 2.9"
Powerbase EDGE V-Mount Battery is rated 4.5 out of 5 by 2. Rated 4 out of 5 by Marcus from Pricey but POWERFUL!! Let me start by explaining what I mean by pricey. Tehre are other v-mount batteries on the market that cost the same price or less and over more power. HOWEVER, the mounting options, and the very detailed power activity monitor, dual d-tap and USB ports, and fact that this battery is so light in weight evens it out and makes it worth the cost. Rated 5 out of 5 by David from Great little battery Im using the C100 cable that Core SWX makes for this battery to power my fuji XT3 (using the hand grip) and runs great! (Im sure Core SWX wouldnt recommend this but it works just fine (and Im sure they appreciate my 5 stars). Is it faster to charge this via the wall charger or via dedicated V-Mount charger? Chargers that connect to the battery through the V-Mount as a general rule of thumb are faster than chargers that connect through the D-Tap Port. The Core SWX X2S 2-Bay Vertical V-Mount Battery Charger, B&amp;H # COGPX2S, will charge the battery much faster than the Core SWX PB70C15 D-Tap Wall Charger, B&amp;H # COPB70C15. How can we charge this? Hi, all you need is a d-tap charger, core has one specifically for their batteries - https://www.bhphotovideo.com/c/product/1380598-REG/core_swx_pb70c15_single_position_powertap_charger.html I am using this combination and it works like a dream. Other d-tap chargers should work fine as well. Could I use this with my fujifilm xt3 and use the usb ports to power the camera through the cameras usb port? Hard to find the correct dummy batteries for fuji. In short, no. Not familiar with the XT3, but no professional DSLR I know takes power in over USB.